Designers from around the world have come to Kickstarter over the past five years to bring their creations to life. They’ve created world-class products with the help of hundreds of thousands of people, and have helped usher in an exciting and democratic new era of product design. Today those efforts reach an incredible milestone with the launch of a collaboration between Kickstarter and the MoMA Design Store. For the next two months, 24 Kickstarter-funded projects will be available through the MoMA Design Store in New York City, and online. These products were hand-selected by MoMA’s amazing curators, and feature some of the most exciting new products in the world of design. You can explore these selections here. These are not the first Kickstarter-funded products to land in the MoMA Design Store. Last year the Amplifiear, an iPad speaker that was supported by 1,453 backers, entered the store. Shortly thereafter, the 3Doodler, the Lumio, Frank, and the Musguard were also selected. Kickstarter has quickly become a hub for the global design community, and has pioneered a sea change in how designers work. To date, more than $158.8 million has been pledged to 7,778 design projects on Kickstarter by thousands of people all over the world. This collaboration between Kickstarter and the MoMA Design Store is a moment of real cultural significance. Here are works created by designers and the public, sharing and collaborating, showcased in one of the most revered institutions of the world. We’re all capable of creating incredible things. Great news. Looking forward to many exciting products! I didn't even see it announced anywhere - though you'd think it would be in the Style Guide. Some other random commenter cried out in the 'Meet the Team' blog entry a few days ago, though. The scissors in the bottom make my eyes bleed, and not because they're jabbed into them, but because of their new color. On second thought, it almost makes me wish they were jabbed into my eyeballs after all. Go back to your original colours! 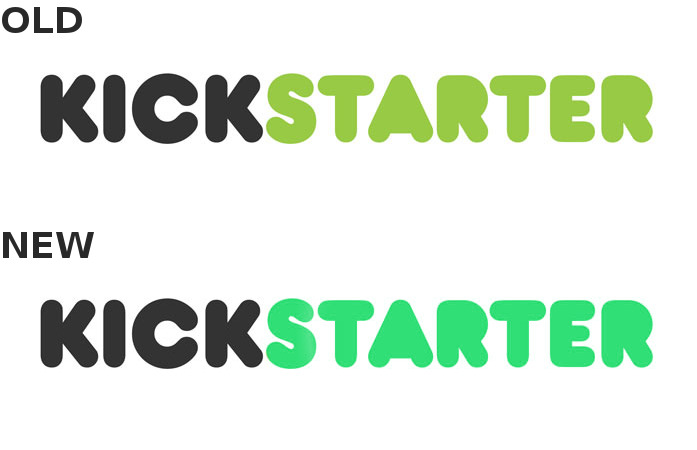 The new Kickstarter green is garish while the completed pie now looks garish!! I love this,and will pay MoMA a visit next time I am in NYC. It is so cool how Kickstarter has become a part of everyday life.